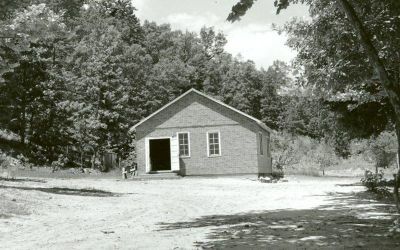 Bethel Springs Mennonite Church in Culp, Arkansas in July 1947. Source: Mennonite Community Photograph Collection, The Congregation (HM4-134 Box 5 Folder 1 photo 010.7-9). The Bethel Springs Mennonite Church (Conservative Mennonite Conference, formerly Mennonite Church) located 2 miles south of Calico Rock, and west 5 miles on Culp Road, was begun by Maud Buckingham Douglass, who after the death of her first husband at La Junta, Colorado, finished a nurses' training course there, joined the Mennonite Church there, and then returned to her Arkansas home. A committee of the Missouri-Kansas Conference arranged monthly preaching appointments and a small membership was secured. The first pastor sent was Nelson Histand, and later Frank Horst served the congregation. A church school developed from a one-room grade school with one teacher, into a grade and high school with five teachers, and a building equipped to accommodate the work. Business enterprises for the benefit of the people were started by Christian investments. The membership increased from one, when ministers visited the locality in 1935, to upwards of 88 in 1953. Two more churches have been built besides the one at Culp; one in the neighborhood southwest of Mountain Home, called Mountain View; the other southeast of Culp and south of Calico Rock, in the neighborhood of Optimus called Mt. Joy. Other appointments, Sunday school, and summer Bible schools are held at various points. Bethel Springs was a member of the South Central Mennonite Conference of the Mennonite Church, but at the time of the formation of Mennonite Church USA changed its affiliation to the Conservative Mennonite Conference. In 2009 it had 25 members. Shank, John R. "Bethel Springs Mennonite Church (Calico Rock, Arkansas, USA)." Global Anabaptist Mennonite Encyclopedia Online. 1953. Web. 26 Apr 2019. http://gameo.org/index.php?title=Bethel_Springs_Mennonite_Church_(Calico_Rock,_Arkansas,_USA)&oldid=146937. Shank, John R. (1953). Bethel Springs Mennonite Church (Calico Rock, Arkansas, USA). Global Anabaptist Mennonite Encyclopedia Online. Retrieved 26 April 2019, from http://gameo.org/index.php?title=Bethel_Springs_Mennonite_Church_(Calico_Rock,_Arkansas,_USA)&oldid=146937. Adapted by permission of Herald Press, Harrisonburg, Virginia, from Mennonite Encyclopedia, Vol. 1, pp. 314-315. All rights reserved.